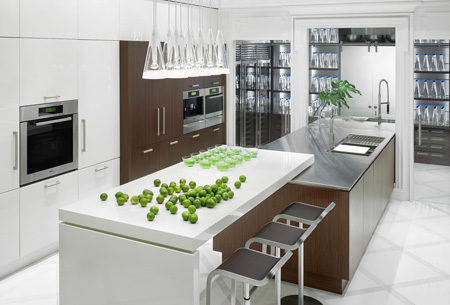 Welcome to Crown Custom Imports, your US supplier of Mekal products, the world's leading manufacturer of custom stainless work surfaces. For over 50 years Mekal has been internationally renowned for it's custom client projects using their state-of-the-art technology with its trademark dedication to superior workmanship. 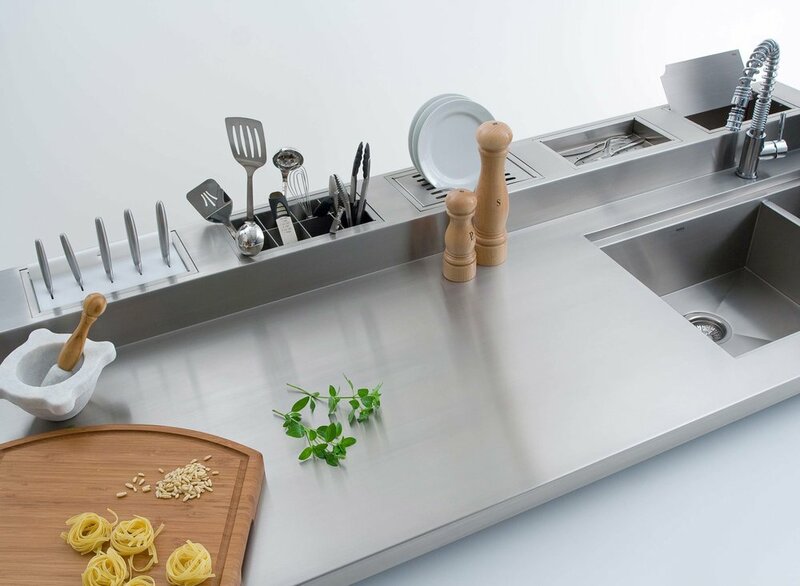 Mekal employs the highest quality raw materials, which it uses to design and manufacturer high-end stainless steel solutions of the utmost quality. 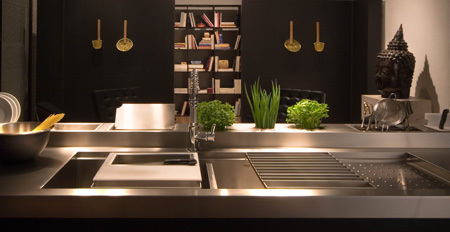 Mekal's customization and innovation will breathe life into every project. Find out why clients that demand superior quality and customization demand Mekal. 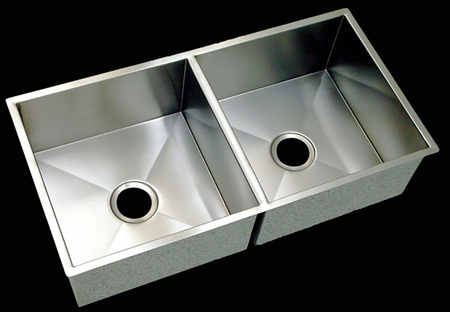 Visit our gallery to view some of Mekal's custom stainless solutions. 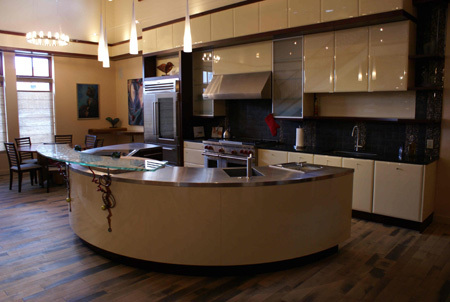 Mekal offers a variety of products with flexible production for the kitchen & bath. Mekal goes where your imagination leads. Please contact us for more information to locate a Mekal dealer in your area. 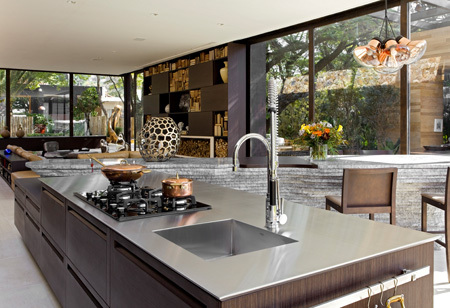 Beauty, practicality and durability are the cornerstone attributes of stainless steel. 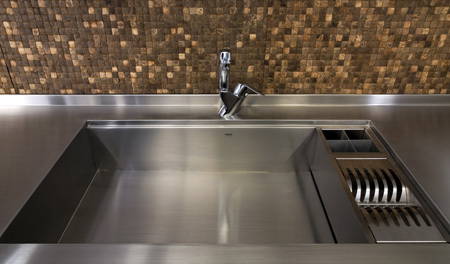 Stainless steel is striking - accentuating any environment reflecting and adapting to the most varied colors; and always emulating a touch of class and exquisite taste. 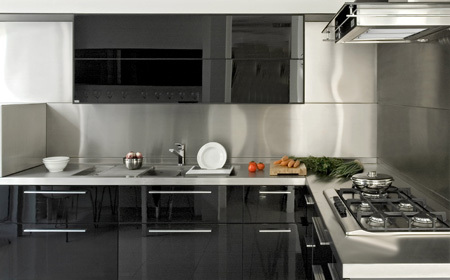 Stainless steel is simple and beautiful combination with other materials such as wood, glass and stone. The ease of maintenance, resistance to heat, stains and corrosion is some of the other remarkable qualities of the material. Q. 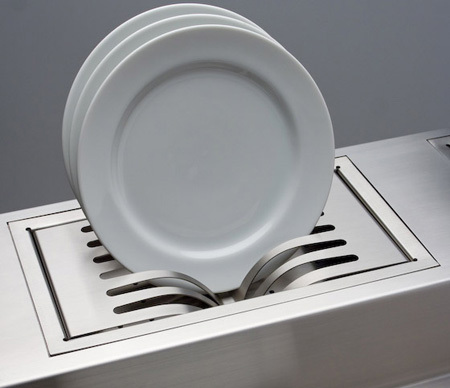 How do I clean my Stainless? Clean with warm water and soap using a soft cloth or sponge. 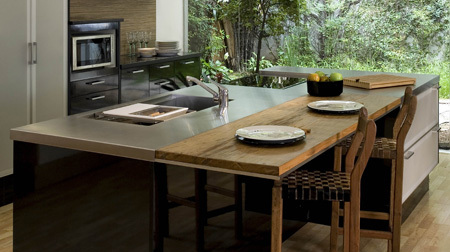 Use a clean soft cloth to dry countertop thoroughly to avoid water-borne minerals that can mark the surface. Use a scotch-brite pad in the direction of the grain to remove tough stains. Do not use steel wool or derivatives. These release small particles creating a residue on the surface that will give the impression that the top is pitting or rusting. Do not use Bleach or any other product that contains Hypochlorite. Never leave acidic foods on the countertop for long periods of time as the acid may cause a stain. Q. Is stainless steel easily scratched? 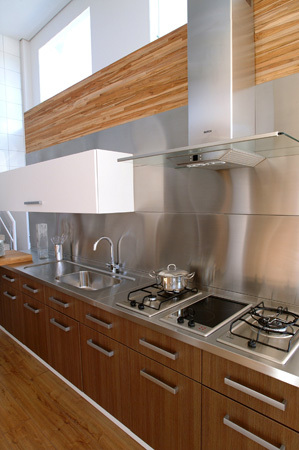 Because of the inherent resistance and toughness of stainless steel, most scratches do not cause wear. When you first get your top small scratches will be more visible, but will start to blend together as the top develops a natural patina with use over time. 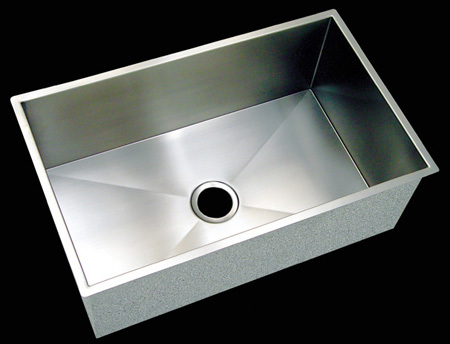 A brushed finish has lots of micro-scratches already on the surface so it will hide normal wear and tear better than a top with a mirror finish. You may be able to blend in a small scratch by using a 3m scotch brite pad and apply light pressure in the direction of the grain. Q. Will stainless steel rust? No. 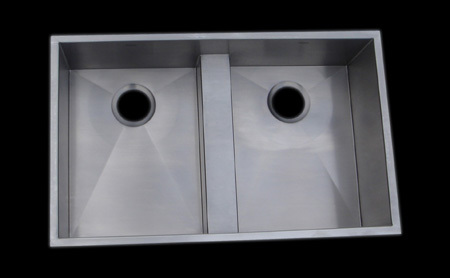 Metallurigically, stainless steel is incapable of pitting or rusting. The appearance of "rust" on stainless is typically caused by the corrosion of small deposits of carbon steel embedded into the surface. This can be the result using steel wool to clean stainless steel. Small bits of the steel wool remain on the surface and the iron in the steel wool rusts. Q. How about bacteria with stainless steel? 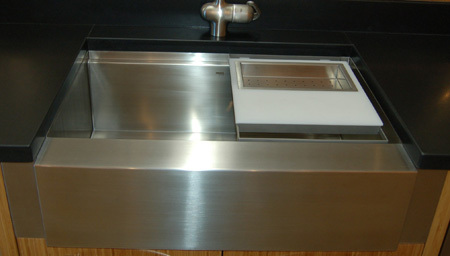 Stainless steel is a smooth non-porous surface and does not allow for the accumulation of residue. This makes it the preferable material for labs, agribusiness and commercial kitchens. 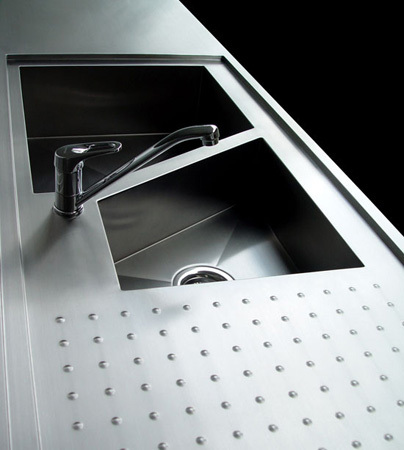 The FDA established criteria and regulations to promote stainless steel as the choice material for bacteria-free hygienic environments. Q. 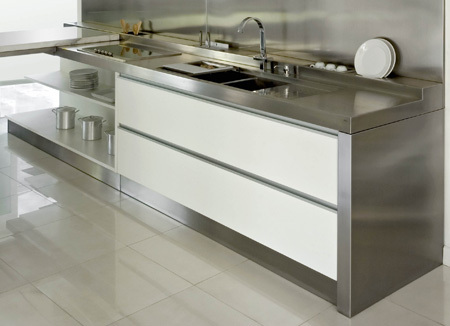 What grade of stainless steel does Mekal employ? Mekal manufactures its products using only A.I.S.I. 304 e 316 stainless steel. Q. What is the maximum width and length for one piece? The maximum length can slightly vary depending on the thickness of the edge and amount of return. The maximum width is 54" and the maximum length is 173" with an edge thickness of 1 1/2". Q. 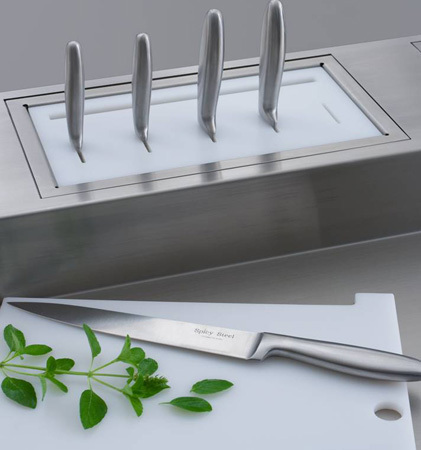 How do I incorporate stainless steel into my design? With consideration to your work surfaces remember that you want to accomplish a look that is both aesthetically pleasing and practical. 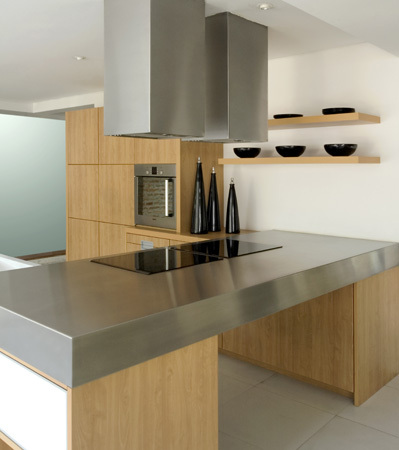 Whether considering an island worktop, a sink run, or an entire deck surface, your stainless steel top can serve as a focal point in your overall design. In general good design is the ability to combine a mixture of materials to add interest while at the same time not compromising function. Allow enough contrast between your materials so that your individual elements have their own identity. 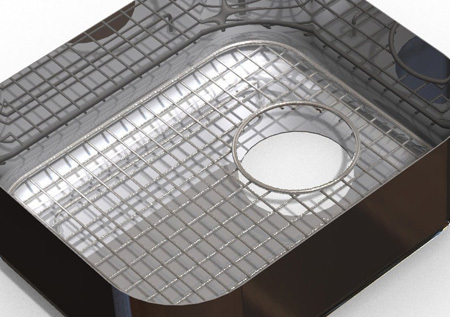 Learn more about Mekal's Stainless Steel solutions.